SPOKANE, Wash. (AP) — A new study shows that different types of deer react differently when approached by hungry wolves. SEATTLE (AP) — UW Medicine says a website server inadvertently made internal files concerning nearly 1 million patients available on the internet. The King County Medical Examiner's Office said Thursday that the cause of sophomore Hayley Smith's death was a pulmonary embolism. SEATTLE (AP) — A 19-year-old University of Washington student is dead after slipping on a sidewalk and hitting her head. University police Maj. Steve Rittereiser said it was not immediately clear if the woman, a sophomore, slipped on ice or what the cause of the fall was. He said detectives are investigating. OLYMPIA, Wash. (AP) — Dogs and cats that have been used for laboratory testing at public universities and other research facilities would have to be offered for adoption before being euthanized under a measure being considered by a Senate committee. The Spokesman-Review reports that the bill, which received a public hearing Tuesday, had strong support, with no one testifying against it. SEATTLE (AP) — The University of Washington has won City Council approval for an immense growth plan including a high-rise "innovation district." HELENA, Mont. (AP) — The Billings Clinic Foundation is seeking to raise $3.3 million to keep Montana's brand-new psychiatry residency program going once a grant covering its first three years of operations ends. Billings Clinic officials said Monday that Blue Cross and Blue Shield of Montana started the drive with a $250,000 donation to the program that launched in September as a regional track of the University of Washington Psychiatry Residency Training Program. SEATTLE (AP) — The driver of a charter bus carrying the University of Washington's marching band that slid off eastbound Interstate 90 on Thanksgiving night and rolled onto its side was cited for driving too fast for conditions. ANCHORAGE, Alaska (AP) — The first formal count of polar bears in waters between the United States and Russia indicates they're doing better than some of their cousins elsewhere. Polar bears are listed as a threatened species because of diminished sea ice due to climate change. But university and federal researchers estimate a healthy and abundant population of nearly 3,000 animals in the Chukchi Sea off Alaska's northwest coast, according to a study published Wednesday in Scientific Reports. SEATTLE (AP) — A group of Republican college students in Seattle threatened to sue a local bar in order to host an event celebrating the confirmation of Supreme Court Justice Brett Kavanaugh. Kavanaugh was sworn in Saturday after a contentious nomination battle that culminated with a Capitol Hill hearing where the judge emphatically denied allegations of sexual misconduct and acknowledged drinking alcohol while underage. SEATTLE (AP) — The deaths of two female students from Thailand have been ruled a murder-suicide, according to authorities in Seattle. SEATTLE (AP) — The University of Washington Law School has a new dean. SEATTLE (AP) — The University of Washington is expecting the largest incoming freshman class in its history. The school's flagship Seattle campus will have about 7,050 first-year students, up from a little less than 6,800 last year. Sixty-three percent are from Washington state. SEATTLE (AP) — Thousands of athletes have marched into Husky Stadium in Seattle for the opening ceremony of the Special Olympics 2018 USA Games. Athletes representing all 50 states and the District of Columbia on Sunday afternoon waved and smiled to cheers from spectators at the University of Washington. Starting Monday, more than 4,000 athletes will compete in 14 sports including gymnastics, basketball, swimming, power lifting and standup paddle boarding. KODIAK, Alaska (AP) — The presence of risk factors for some chronic health problems was found to be higher in a sample of Alaska gillnetters than the general population, according to researchers. SEATTLE (AP) — The University of Washington will pay $122,500 to settle a lawsuit filed after the college billed a Republican club security fees for a rally. The UW College Republicans sued, saying the bill for $17,000 to cover security costs for the campus event violated free-speech and other constitutional rights. SEATTLE (AP) — Tuition at the University of Washington will increase by $218 next school year for undergraduate students from the state. The Seattle Times reports the university's board approved the 2.2 percent increase Thursday. The tuition will be $10,127 for students at the university's campuses in Seattle, Bothell and Tacoma. NEW ORLEANS (AP) — A man who faced an attempted murder charge as a teenager in a case that sparked the "Jena 6" civil rights protest in central Louisiana in 2006 has graduated from law school. SEATTLE (AP) — The CIA has turned over 139 documents to settle a lawsuit brought by the University of Washington's Center for Human Rights. SEATTLE (AP) — A case of Legionnaires' disease has been suspected at the University of Washington Medical Center. KOMO-TV reported Wednesday that this is the third time in as many years that the disease has been suspected at the facility. Officials said the patient "has been diagnosed with a highly probable health care associated Legionella pneumonia." Officials said the patient is in satisfactory condition and is responding well to treatment. SEATTLE (AP) — Special Olympics athletes will be playing ball with celebrities and CEOs in Seattle ahead of the official games this summer. ESPN said Wednesday that it's hosting a celebratory event at the University of Washington's Husky Ballpark on July 1 before broadcasting the 2018 Special Olympics USA Games. They'll have corporate teams compete in basketball, soccer and golf for money benefiting local charity as part of the unofficial event. SEATTLE (AP) — Health officials say at least one person was bitten by a rabid bat at University of Washington and that multiple people were likely exposed to it. Public Health of Seattle and King County says the bat was reportedly found behind Husky Stadium at about 2 p.m. Saturday. Officials say the bat bit one person and latched onto that person's fingers. COEUR D'ALENE, Idaho (AP) — A northern Idaho philanthropist convicted of poaching a moose near Mica Bay has been ordered to serve 30 days in jail. SEATTLE (AP) — The University of Washington has agreed to improve its parking access for people with mobility impairments in response to a federal lawsuit. SEATTLE (AP) — The interim dean of the University of Washington's school of dentistry has abruptly resigned amid a multimillion budget deficit and criticism over the loss of specialty services after the school laid off nearly two dozen people earlier this month. MINNEAPOLIS (AP) — A new study says Minnesota residents have the fourth longest life expectancy in the country, with an average life span of almost 81 years. The University of Washington's Institute for Health Metrics and Evaluation published the study this week, The Star Tribune reports . The research ranked Minnesota behind Hawaii, California and Connecticut. A new effort is afoot to create a male birth control pill. The prospect could become reality in the next decade, researchers said. Three doctors and a medical student crowded around a computer screen at Sacred Heart Medical Center. The internal medicine team wasn’t there to discuss test results or speculate about a patient’s diagnosis. Instead, they considered a painting: Salvador Dali’s “Swans Reflecting Elephants,” which shows three swans floating in a pond in an otherwise desolate landscape. The swans’ long necks, on reflection in the pond, are transformed into elephant trunks. College Republicans invited the Vancouver, Washington, based right-wing group Patriot Prayer to speak in Red Square for a "freedom rally." 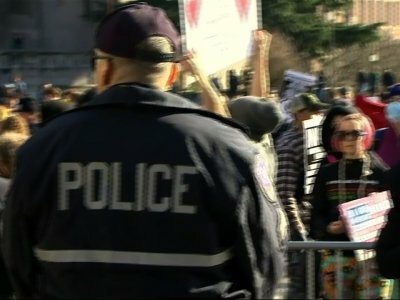 SEATTLE (AP) — A federal judge has blocked the University of Washington from billing the College Republicans a $17,000 security fee for a campus rally on grounds that it violates free speech rights.